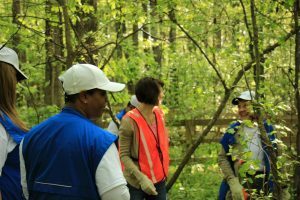 Every year, Doosan Corporation holds a day of service around the globe, helping local communities grow and prosper. 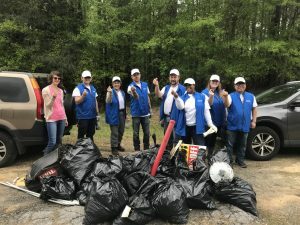 This year, Doosan Industrial Vehicle of America Corporation (DIVAC) worked with Gwinnett Clean & Beautiful to clean a road and a stream near the DIVAC headquarters in Buford, Georgia. As DIVAC celebrates our 50th Anniversary, Gwinnett celebrates their 200th Anniversary. It was a pleasure partnering in a county with such a rich history, and working to keep the nature of Gwinnett beautiful and clean, as it should be. DIVAC cleaned near Ivy Tributary off of Plunkett Road. Additionally, DIVAC cleaned the parts of Mall of Georgia Blvd and Sunny Hill Road. DIVAC successfully collected 22 bags, collecting a rough total of 440 pounds of trash. All in all, it was a beautiful day and DIVAC enjoyed partnering with a community organization that values working and winning together. Doosan Industrial Vehicle America Corporation looks forward to next year’s Doosan Day of Community Service!